Our Price: Call for Pricing! The Cisco TelePresence Server is an innovative software solution enabling high-quality standards-based conferencing for the mobile or desktop user and the immersive room meeting participant. Compatible with a range of hardware platforms, the Cisco TelePresence Server is a versatile, highly scalable solution for mid market and larger enterprise customers. The Cisco TelePresence Server is a key component of the Cisco Pervasive Conferencing architecture, and is deployed with Cisco TelePresence Conductor in order to provide full flexibility and scale. WebEx enabled TelePresence, with the Cisco TelePresence Server, allows you to enjoy fully integrated, scalable conferences involving WebEx users and telepresence endpoints. The Cisco TelePresence Server provides high-quality, flexible, 360p to full high-definition (FullHD) multiparty conferencing and collaboration. Specifically engineered to deliver the best user experience for any device, the Cisco TelePresence Server provides predictable, reliable, high-quality video and content-sharing capabilities. With views optimized for meeting rooms and desktop and mobile devices using Cisco Jabber™ the Cisco TelePresence Server delivers any-to-any multiparty conferencing. To enhance the experience, conference attendees can gain the full benefit of screen layouts designed specifically to meet their needs. The Cisco ActivePresence capability of Cisco TelePresence Server, a leading patent-pending feature, enables the delivery of next-generation multiparty conferencing, offering a view of all attendees in a meeting while giving prominence to the active speaker. While the active speaker occupies most of the screen, an overlay of others in the call appears in the lower third of the screen, giving participants a natural view of everyone sitting around the virtual table. A critical requirement for all customers is ensuring a high return on investment (ROI). The Cisco TelePresence Server has a software upgrade path that enables customers to deploy new features as required, and with a cost-effective licensing model, they can closely manage their investment while reaping the rewards of lower travel expenses and increased employee productivity. Designed to meet the needs of organizations from small businesses to global multinationals, the Cisco TelePresence Server has a scalable architecture, enabling customers to start small and increase the scale of their solutions as their businesses grow. The Cisco TelePresence Server on virtual machine, which runs on the Cisco Unified Computing System™ (Cisco UCS) or third party specification-based server platforms, offers a virtualized solution. The Cisco TelePresence Server on the Cisco Multiparty Media 310 and Cisco Multiparty Media 320 entry level appliance solutions which can be stacked to grow with your business video usage over the long term. The Cisco TelePresence Server on the Cisco TelePresence Server MSE 8710 (Cisco MSE 8710) is a chassis-based platform that is ideal for large enterprises and service providers requiring a high-availability and highly scalable solution. Scalability is achieved through clustering up to four Cisco MSE 8710 blades as a single unit. The Cisco TelePresence Server can also run on the Cisco MSE 8510 and Cisco TelePresence MCU 5300 (MCU 5300) platforms. The Cisco TelePresence Server provides high-quality, standards-based conferencing for the mobile or desktop user and the immersive room meeting participant. It is a key component of the Cisco Pervasive Conferencing architecture and compatible with a range of hardware platforms. The Cisco TelePresence Server is a versatile, highly scalable solution for mid-market and larger enterprise customers. The Cisco TelePresence Server on Virtual Machine runs on the Cisco Unified Computing System (Cisco UCS) or third party specification-based server platforms. The Cisco TelePresence Server on the Cisco Multiparty Media 310 and Cisco Multiparty Media 320 offers entry level appliance options. The Cisco TelePresence Server on the Cisco TelePresence Server MSE 8710 is a chassis-based platform ideal for large enterprises and service providers requiring a high-availability and highly scalable solution. The Cisco TelePresence Server can also run on the Cisco TelePresence MCU MSE 8510 platform. WebEx enabled telepresence allows you to join a conference from WebEx or telepresence endpoints - highly scalable conferencing from any location using any device. Cisco TelePresence Server works in conjunction with Cisco TelePresence Conductor (v2.2 or later) or CTX (v1.3 or later), providing scalable ad-hoc conferencing and enabling increased efficiency. – Dynamic optimization: Make full use of the conferencing capacity of Cisco TelePresence Server through the dynamic allocation of resources. – Conference service levels range from 360p video with composited content through to FullHD video with FullHD content. – Mixed conference types (ad hoc and rendezvous) and mixed resolutions (360p to FullHD) are supported. Improved productivity: All users enjoy a high-quality experience, accessible from mobile devices running Jabber through to desktop or immersive systems. Thus remote and home workers can collaborate more effectively and decrease travel costs. Best in class experience for the user device: Highly scalable conferencing is available to users with mobile, meeting room or immersive endpoints. Maximized reach: Optimized views and standards-based interoperability allow any-to-any conferencing, helping ensure conferences are effective and support a wide range of participant endpoints. The server is standards-based and compatible with major vendors' videoconferencing endpoints. It is highly scalable to meet current and future organizational needs. It provides participants with the best possible view for their endpoint. The server provides an easy-to-use and versatile management interface. It is designed to carrier-class levels of reliability and availability. The server is compatible with a range of dedicated hardware platforms or Cisco UCS servers. Cisco TelePresence ActivePresence capability supports a full-screen immersive view of the primary speakers with an overlay of others in the call; it is designed to maximize the large-scale immersive experience and is available on all ports. Cisco TelePresence ActiveControl allows you to see the participant lists and control conferences and layouts. It supports single and multiscreen standards-based telepresence systems. The server interworks with Polycom RPX and TPX telepresence systems while preserving the full Cisco ActivePresence view (requires feature key). It integrates with Cisco TelePresence Management Suite (Cisco TMS), Cisco TelePresence Conductor (v2.0 or later), or CTX (1.3 or later). The TelePresence Server on Cisco MSE 8710 or Cisco TS 7010 can be locally managed or remotely managed (by Cisco TelePresence Conductor or CTX). All other versions can be run only in remotely managed mode. Four layout families are provided for single-screen endpoints including panel-switched Cisco ActivePresence capability. Participants can dial in or can be called from the web interface. Automatic Gain Control (AGC) is supported to adjust audio controls to help ensure a consistent experience. Cisco ClearPath is supported, providing improved media resilience with lossy networks. Up to FullHD transcoding for both video and content is supported for every participant. Cisco TelePresence Universal Port technology is supported. 360p to FullHD video resolutions are supported (up to 1080p30 or 720p60 frames per second [fps] at up to 6 Mbps per screen including content with H.264). Comprehensive HD audio is supported. Additional wideband audio ports are available. Advanced Encryption Standard (AES) encryption is supported. Integrated Cisco TelePresence ClearVision technology provides resolution enhancement. OneTable and Room-Switched configurations are supported. 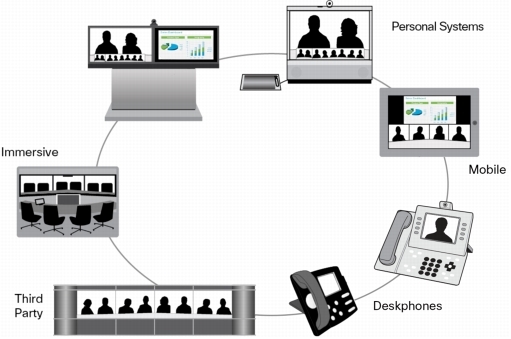 Figure 1 shows a graphic of the Cisco TelePresence Server interoperability solution. The Cisco TelePresence Server on the Cisco MSE 8710 supports up to 48 FullHD (1080p30) or 96 HD (720p30) screens per conference when four blades are clustered. In locally managed mode the maximum capacity is achieved with 12 screen licenses per blade, giving 12 X FullHD (1080p30) or 24 x HD (720p30) screens. In remotely managed mode the maximum capacity per blade is still achieved with 12 screen licenses giving 12 x FullHD or 24 x HD or 48 x SD (w448p/480p30) or 96 x 360p resources, although the resources can be used more flexibly; please refer to Table 8 for further details. Up to 104 calls are supported in one cluster of blades. The Cisco TelePresence Server on the Media 310 supports up to 5 x FullHD (1080p30) or 10 x HD (720p30), or 20 x SD, or 40 x 360p screens per unit. Although the resources can be used more flexibly; please refer to Table 8 for further details. Maximum capacity is achieved with five screen licenses per unit. Up to two units of the Media 310 can be stacked together to increase capacity (optional stacking cable is required). Up to 80 calls are supported in a stack of 2 appliances. The Cisco TelePresence Server on the Media 320 supports up to 10 x Full HD (1080p30) or 20 x HD (720p30), or 40 x SD, or 80 x 360 screens per unit. Although the resources can be used more flexibly; please refer to Table 8 for further details. Maximum capacity is achieved with 10 screen licenses per unit. Up to two units of the Media 320 can be stacked together to increase capacity (optional stacking cable is required). Maximum capacity of two Media 320 platforms is 20 x Full HD screen licenses. Up to 104 calls are supported in a stack of 2 appliances. The Cisco TelePresence Server on the Cisco TS 7010 supports up to 12 x FullHD (1080p30), 24 x HD (720p30), 48 x SD, or 96 x 360p screens per appliance. In locally managed mode the maximum capacity is achieved with 12 screen licenses per appliance, giving 12 x FullHD (1080p30) or 24 x HD (720p30) screens. In remotely managed mode the maximum capacity per appliance is still achieved with 12 screen licenses giving 12 x FullHD or 24 x HD or 48 x SD (w448p/480p30) or 96 x 360p resources, although the resources can be used more flexibly; please refer to Table 8 for further details. The Cisco TelePresence Server (Virtual Edition) can run on a Cisco UCS C-Series Rack Server or on other UC on UCS specification-based hardware. A 10-core virtual machine supports up to 6 x FullHD, 12 x HD, 24 x SD, or 48 x 360p screens. Although the resources can be used more flexibly; please refer to Table 8 for further details. Maximum capacity is achieved with 6 screen licenses per virtual machine. Note: Capacity figures represent capabilities of Cisco TelePresence Server 3.1 when used with Cisco TelePresence Conductor 2.2. Tables list the technical, video, network, and audio, and network, management and security specifications, respectively, of Cisco TelePresence Server. Product compatibility The server is standards-based and compatible with major vendors' endpoints. The server can combine immersive, high-definition (HD), Standard-definition (SD), and 360p endpoints within the same virtual meeting. The server provides automatic audio and video transcoding along with transrating on all calls. Each endpoint has its own decode and encode. Automatic content handover is supported. It supports standard (4:3) and widescreen (16:9) content. Dual Video is supported with H.239, Binary Floor Control Protocol (BFCP), or Auto Collaborate. Picture in Picture: Video and content are composed into the video stream. Participants can have their own content transcoded at up to 1080p30 or WUXGA (1920 x 1200) @ 27frames per second (fps). Built-in web server Complete configuration, control, and monitoring of the system and conferences are supported. Language support English is the standard language. XML management application programming interface (API). The server offers full H.323* (supported directly on Cisco MSE 8710 and Cisco TS 7010 platforms - other TelePresence Server platforms require Cisco TelePresence VCS to interwork H.323) and SIP decoding, which is supported on all platforms. The server offers configurable event logs. The server offers configuration backup to network. The server offers the ability to perform secure upgrades through Ethernet. Quality of service (QoS) The server provides configurable differentiated services code point (DSCP) or type of service (ToS)/IP Precedence. Cisco TelePresence PacketSafe technology provides intelligent down speeding, packet pacing, and packet-loss concealment to help ensure optimum video and audio quality. The server supports dynamic jitter buffering. 1 Cisco TelePresence Server on the Media 310, Media 320, and Virtual Editions only support remotely managed mode, which requires an additional external application such as the Cisco TelePresence Conductor (v2.0 or later) or the CTX (v1.3 or later). * Cisco TelePresence Server software (R-VTS-K9) requires UCS or standard based server based platforms, for information on tested/recommended hardware, please see Cisco Virtualization http://www.cisco.com/en/US/docs/telepresence/infrastructure/ts/install_guide/vts_install.pdf. Download the Cisco TelePresence Server Datasheet (PDF).